Detail of Joseph Ignaz Mildorfer (1719-1775), "Pentecost" (1750s), oil on canvas, 55x33 cm, Hungarian National Gallery, Budapest. Larger image. 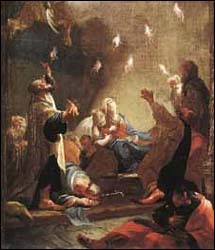 Other Pentecost paintings. The Day of Pentecost, which occurs 50 days after Passover is a major Jewish feast day. It is celebrated by the Christian Church as the day the Holy Spirit fell upon the believers. I've included links to a number of materials on the Day of Pentecost. 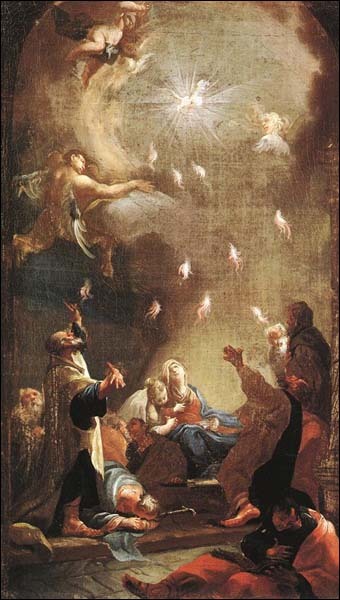 My focus here is on what happened on the Day of Pentecost itself, not on the doctrine of the Holy Spirit and the baptism of the Holy Spirit in particular.